From the New York Times bestselling author of The Surgeon and The Apprentice comes a chilling new novel of suspense featuring Boston medical examiner Dr. Maura Isles, on the deadly trail of an anonymous madman who’s committed an unholy crime. Not even the icy temperatures of a typical New England winter can match the bone-chilling scene of carnage discovered in the early morning hours at the chapel of Our Lady of Divine Light. Within the sanctuary walls of the cloistered convent, now stained with blood, lie two nuns—one dead, one critically injured—victims of an unspeakably savage attacker. The brutal crime appears to be without motive, and the elderly nuns in residence can offer little help in the police investigation. But medical examiner Maura Isles’s autopsy of the dead woman yields a shocking surprise: Twenty-year-old Sister Camille, the order’s sole novice, gave birth before she was murdered. Then the disturbing case takes a stunning new turn when another woman is found murdered in an abandoned building, her body mutilated beyond recognition. Together, Isles and homicide detective Jane Rizzoli uncover an ancient horror that connects these terrible slaughters. As long-buried secrets come to light, Maura Isles finds herself drawn inexorably toward the heart of an investigation that strikes closer and closer to home—and toward a dawning revelation about the killer’s identity too shattering to consider. 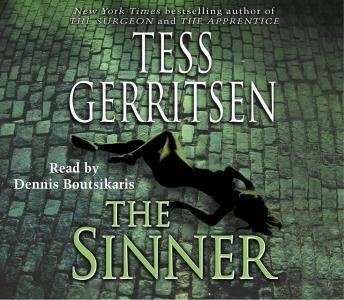 As spine-tingling as it is mind-jolting, The Sinner showcases Tess Gerritsen in peak form—bringing her intimate knowledge of the dark depths of criminal investigation brilliantly to bear. Beneath its layers of startling insight into the souls of its characters, and the richly wrought depiction of the everyday war between good and evil, beats the unstoppable heart of an irresistible thriller.